​Windows that provide strong insulation help create a more comfortable home in both winter and summer. Insulated double pane windows won't lose as much of the home's heat as single pane windows will. Insulated double pane windows can also minimize heat transfer from the exterior. Reducing heat transfer and energy bills, insulated windows are an extremely energy efficient addition to the home. Read on to learn more about insulated glass and the various options available to homeowners today. How Do Insulated Double Pane Windows Work? Insulated glass, otherwise known as insulated glazing, double pane windows, or triple pane windows, typically refers to multi-pane windows that are separated by either a vacuum or other gas-filled space. Often, argon or other special gases are pumped inside insulated double pane windows to create a gas-filled window to further improve their thermal efficiency. Additionally, insulated glass sometimes includes a low-e coating. With the help of dead airspace between the window panes, double pane windows reduce convective currents between the glass, minimizing the transfer of heat through the window. When seal failure occurs at the edges of insulated double pane windows, moisture will begin to form between the window panes. This is one of the top service issues with today's insulated double pane windows, as it requires replacing the glass. Unfortunately it is not possible to simply re-seal the window. Because of this, homeowners should choose their manufacturer and contractor wisely. Luckily, insulated windows such as double pane windows can also include an addition called a spacer bar. This piece is designed to minimize heat transfer by conduction through the device. Basic spacer bars are often made of aluminum or other alloys that conduct heat or cold from the glass surfaces. Warm-edge spacer bars can also add an insulating barrier. Consequently, windows with warm-edge spacers are less likely to gather condensation at the edges of the glass during the cold winter months. Although double pane windows can help to boost the home's energy efficiency on their own, they are the most efficient with gas-fills and low-e glass coatings. Low-e coatings allow in the visible sunlight and repel up to 95% of heat energy, keeping your rooms bright and cool. 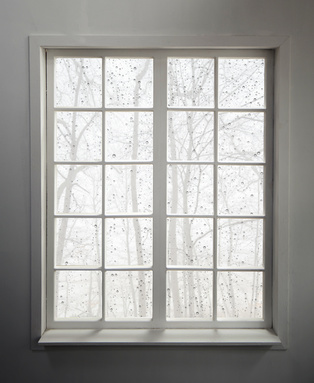 Today, average double pane windows usually feature an airspace between the panes of 1/2“ to 1”. While many individuals still believe that a larger space between the window panes correlates to higher energy efficiency, this simply isn't true. Airspaces smaller than 1/2“ are too small to provide decent insulation, while airspaces greater than 5/8” allow air currents to develop between the two panes. These extra currents actually cause more heat transfer within the glass, reducing the double pane windows' energy efficiency. When it comes to double pane windows, their energy efficiency is up to how much you want to invest in them. By including other energy efficient additions like low-e coatings, gas-filled panes, and spacer bars, homeowners will get the most out of their double pane windows. Double pane windows, especially with additional features, can lower monthly energy bills and make your home a more pleasant, cozier place to live.